After a great deal of confusion about whose hearts were being broken, Tom Petty and the Heartbreakers' second album has struck gold. When the rock group's first album came out about two years ago, it went unadvertised and met stiff competition from new albums by the Eagles and Fleetwood Mac. And to compound problems, New York Doll Johnny Thunder had a punk rock group also named the Heartbreakers. The press, thinking Petty's group was punk, ignored it. But after highly successful American and European tours, there aren't any more identity problems. In fact, Petty is featured playing himself in the recent movie FM. I Need To Know is the single from the golden You're Gonna Get It album, and it's climbign the charts as fast as the album did. According to a recent World-Herald story, Billy Graham, the evangelist -- not the rock promoter, was conducting a crusade in Norway when he was attacked by "the Norwegian Society of Heathens, anarchists, and other demonstrators..."
This rather unruly bunch threw "rotten fruit and cream cakes" at the renowned Mr. Graham. One woman complained that Graham's religious style consisted of "power Christianity." What, one may be wondering, does this have to do with music? Well, not much, but the phrase "power Christianity" has the same ring to it as a term being bandied about currently in rock 'n' roll magazines -- "power pop." I've never really understood what the term means, but it seems to have something to do with the mixing of pop music and hard rock. Or it could mean pop music with weird, usually perverse lyrics. But if the string of chart-toppers that the group has turned out this year is any indication, the Heartbreakers are giving massive transfusions to the music scene. Petty, whose roots come from the music of Roger McGuinn and the Byrds, the Beatles, and Van Morrison, has a crusade to give AM radio 'back to the kids' and his group is the one that's doing most of the delivering. 'Listen to Her Heart,' written by Tom Petty, is proof positive that the Heartbreakers will be around quite a while longer -- a condition that many think is plain incontestable. The second release from Petty and his cohorts proves even tighter and more consistent than their debut album. They project a sound reminiscent of the early Rolling Stones, without losing their originality. All the cuts possess a raw feeling to them and give off unlimited energy. By keeping them short (no song exceeds 3½ minutes), they whet the appetite of the listener and avoid monotony and simplistic repetition. They avoid all the glitter and over-production flooding the racks lately and have a more basic approach to conditions for recording. The album's highlights are "I Need To Know," "When The Time Comes" and "Restless." They even try their hand at a little reggae with "No Second Thoughts." It's impossible not to get caught up in the overall power and magnetism produced in one of the few promising, up and coming bands in the midst of all the "new wave" material. I just got "You're Gonna Get It" by Tom Petty and the Heartbreakers, and really like the album. Can you tell me something about him? Is he English? A: Tom Petty and the Heartbreakers first came to public attention in England, but they're definitely an American band, a product of the music Petty listened to when he was a teen-ager in Gainesville, Fla. -- the Byrds, the Beatles and the Rolling Stones. 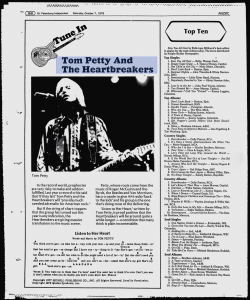 Petty began playing with local bands in Gainesville at the age of 14, and went through close to a dozen groups before forming Mudcrutch with Mike Campbell and Benmont Tench, who play today in the Heartbreakers. Mudcrutch relocated in Los Angeles in 1973, and caught the ear of Shelter Records president Denny Cordell. 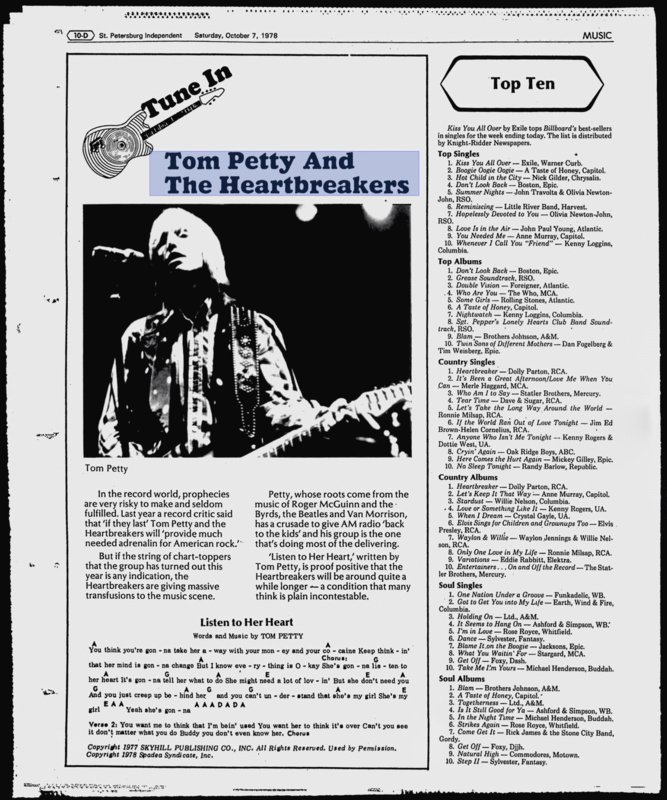 Problems caused the group to split, and in 1975, Petty formed another group -- the Heartbreakers. If only for writing two of the best singles of the year, "I Need to Know" and "Listen to Her Heart," Petty should claim Top Ten status. But he and his group go beyond that. Embracing the commitment of the best 60's bands, and refusing to be limited by any media classifications, the Heartbreakers turn out extremely vital rock 'n' roll for the late '70s. They've assimilated their influences (most obviously the Byrds and the Yardbirds) and come out with refreshing music, uninhibited by extraneous ego-flahsing. The songs are personal, but universal as well, and making that connection is so important. Petty does it consistently.